Shipping is a huge cost for Amazon and its customers. To reduce those costs, Amazon is getting more directly involved in shipping, with moves like buying a portion of aircraft leasing network ATSG in March, and signing a leasing deal with Atlas Air in May. 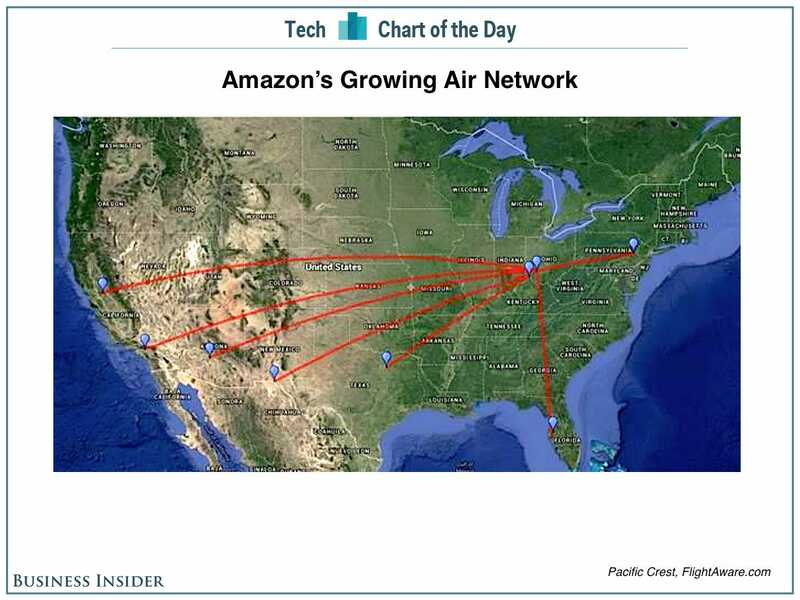 Analysts at Pacific Crest were able to identify seven main airports Amazon is using today, and map some of the routes out. The airports include Allentown, Pennsylvania; Covington, Kentucky, near the Ohio border; Dallas-Fort Worth; Phoenix; Ontario in Southern California; Stockton in Northern California; Tampa, Florida; and Wilmington, Ohio. All are within a 60-minute drive of Amazon fulfillment or distribution centres. Pacific Crest believes these moves could save Amazon $450 million a year.